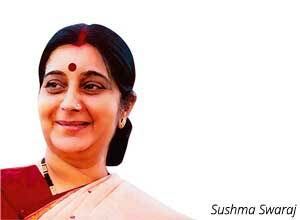 Islamabad: A woman suffering from cancer in Pakistan has urged external affairs minister Sushma Swaraj to help her visit India for treatment after her visa application was reportedly rejected by the Indian embassy. Faiza Tanveer, 25, is suffering from a Faiza Tanveer, 25, is suffering from a recurrent ameloblastoma, an oral tumour which is aggressive in nature. She planned to visit the Inderprastha Dental College and Hospital (IDCH) in Ghaziabad and paid Rs 10 lakh in advance for treatment, according to a Pakistani media report. But the Indian High Commission in Islamabad rejected her medical visa application, the report said. Tanveer’s mother claimed that her application was rejected because of deteriorating ties between the two countries. That forced Tanveer to take to social media to move Indian authorities. Tanveer in several tweets over the past couple of days has urged Swaraj to intervene. She has also posted her photo and a video that showed her tumour. Last month, India issued a medical visa to a two-and-a-half-month-old baby from Pakistan, suffering from a heart disease, after his father sought intervention of external affairs minister Sushma Swaraj. Ken Sid, a Pakistani national, reached out to Swaraj through the social media platform for a medical visa for his son, who has a heart complication which cannot be treated in Pakistan. Swaraj’s intervention came after the infant’s father brought the matter to her notice on Twitter. “It is heartening to see humanity prevailing despite many differences. Thank you for your efforts. Humanity prevails! God bless everyone,” the child’s father tweeted. An official at the Indian High Commission said that a four-month medical visa has been issued to the family so that the boy could undergo heart surgery in India. Ailing Pakistanis frequently to travel to India on medical visas to seek treatment for complicated health problems. Indian hospitals have previously reported receiving around 500 patients from Pakistan every month. Many of the unwell needed a liver transplant, which costs between Rs 20-30 lakh. In 2015, five-year-old Basma from Pakistan had been granted a visa to India for an emergency liver transplant surgery. There are now many tales like hers, sometimes with footnotes on how the travelling patients were helped financially by Indians. However, the visa process for travellers who want to visit India for medical reasons has slowed amid rising tensions between the two countries over a number of reasons, including the issue of cross-border terrorism and Pakistani military sentencing to death Indian national Kulbhushan Jadhav on charges of espionage.